More info:Single supplement from £1140 - £1540. Lazy breakfasts on deck, swimming from the ship and docking at beautiful islands and historic ports, this Croatia coastal cruising holiday offers the perfect mix of relaxation and exploration. 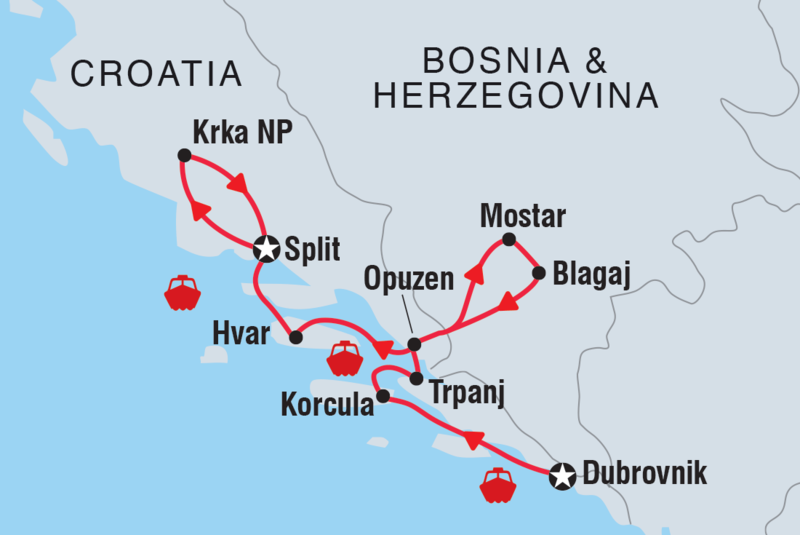 Travel from Split down to Dubrovnik, exploring the Dalmatian coast with its incredibly clean beaches and lovely islands, and enjoy a special detour inland to Mostar, in Boznia and Herzegovina, which most Croatian cruises ignore. See its beautiful bridge, meet local craftsmen and enjoy lunch here. You won’t be spending long days at sea so, while this cruise is relaxing, it’s never boring. There are lots of excursions both on the islands and the mainland, guided walks and port stops, and the journey time between islands is modest. Visit a lavender farm and tastes its honey on Hvar, travel to Krka National Park for a boat cruise and some river and waterfall swimming, and visit a winery on Korcula. The captain will regularly stop the ship for swim breaks in the clear waters, too. A small ship cruise like this one, with between 30 and 50 passengers, has far less negative environmental impact than huge cruise liners, and while the big ships have to moor at sea, a small ship can cruise right into port towns like Hvar and Korcula, so you can simply hop off to explore. There’s no cruising through the night, either. The ship will remained docked in port, so you have more time to go ashore for dinner and to enjoy the evening atmosphere. Travelling by small ship has a much lower impact on the environment and specifically, on the towns and rural areas that we visit. Croatia is experiencing a tourism boom, therefore by travelling off the roads, we are not impacting the local communities and countryside in the same way that large scale coach touring may.